Spent one year as an AFS exchange student in Moscow, Idaho, USA, 1980. Completed his studies as an interpreter/ translator in Ghent, Belgium, 1984. Belgian windsurfing champion in the wave-riding discipline, 1987. Climbing expedition Cho Oyu, Tibet, 1990. Mount Kenya climb, N/E and S/W faces, Kenya, 1991. World record holder (Guinness record) altitude mountain biking, Teide, Tenerife, 1991. Winter ascent Mont Blanc, France, 1992. Mount Fuji winter ascent, Japan, 1992. Ironman (full triathlon) finisher, Australia and Belgium, 1993. Organiser and participant "Karakoram Bike Adventure", 1200km through Pakistan and China, 1994. Second place finisher Ultramarathon "La Transardennaise", 160 km, Belgium, 1994. Polar trek Langjökul Glacier, Iceland, 1995. Mount Cameroon climb, Cameroon, 1995. Trans-Greenland expedition with Alain Hubert, 700 km on skis with powerkites, 1995. Alpamayo trek and ascent Mount Pisco, Peru, 1996. Mount Everest climb (camp two) and ascent of Island Peak, 1996. Polar trek Spitsbergen, Svalbard, 1997. South Through The Pole: Crossing of the Antarctic continent with Alain Hubert, World premier: 4000 km skis and with revolutionary powerkites, including scientific research, 1997-98. Antarctica 2000: Ascent of Mount Vinson with Julie Brown and polar trek Ellsworth Mountain Range with Rudy Van Snick, 2000. 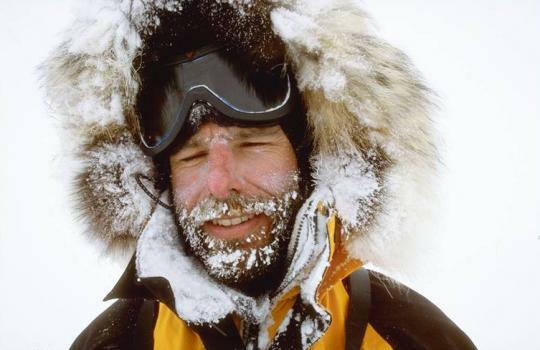 The Ultimate Arctic Crossing: Attempted traverse of the Arctic Ocean from Siberia to Canada. With Alain Hubert. 69 days in autonomy. February - May 2002. Sierre-Zinal Mountain Running Race, Switzerland, August 2003. Les Templiers 65 kilometer mountain race, Nants, France, October 2003. Bering Strait Odyssey: Attempt to cross the Bering Strait from Alaska to Siberia and back. With Troy Henkels. March - April 2005.
the EOS magazine (American Scientific) advisory committee.